Not me, but the baby! I am 30 weeks–yipee! Next week brings single digits, which I always look forward to with great anticipation. I thought I’d share with you the greatest discovery that I have made this pregnancy–Motherhood Secret Fit Maternity pants. If you haven’t tried them, you gotta! They are full panel pants, which I have NEVER EVER worn before, but they are the most comfortable things ever. Every preggo should have a pair. I also had the very fortunate experience (dripping sarcasm here) of taking the 3 hour glucose tolerance test because I failed my 1 hour test. (meaning my blood sugar levels were too high) I “passed” the 3 hour test, but just barley. I was only 1 point away from being diagnosed with gestational diabetes. So, I’m glad that I was under, but it still makes me a little nervous that I was so close. One of the side effects (is that the right term?) of gestational diabetes is BIG babies, and I’d really like to avoid having another 9 pounder if I can, so I’ve been trying to follow the diabetic diet. I have a Dr. appt in a few days and hopefully she’ll be able to give me a little more guidance. But other than that things are great and we are excited for this little one to get here! Yeah for 30 weeks! Not to much longer. You look so great! It was so fun to hang out last night! We will get together next week for sure! Love ya!!!!!! I also love those pants! Congrats on passing your glucose test – that would have stunk big time. Welcome to the home stretch! [the closer you are, the closer I am :)] YEAH!!!! I will never wear any other pants than the hidden full panel type!! You look fantastic! Can’t wait to see this little guy! I am with Lindsay I will never wear any pants other than the full panel ones. you look great for 30 weeks. Hope this home stretch goes well for you and good luck to Rusty with the Blog Frog! Ok I was really excited that someone else was going the 30yr old club with me…..what a let down! 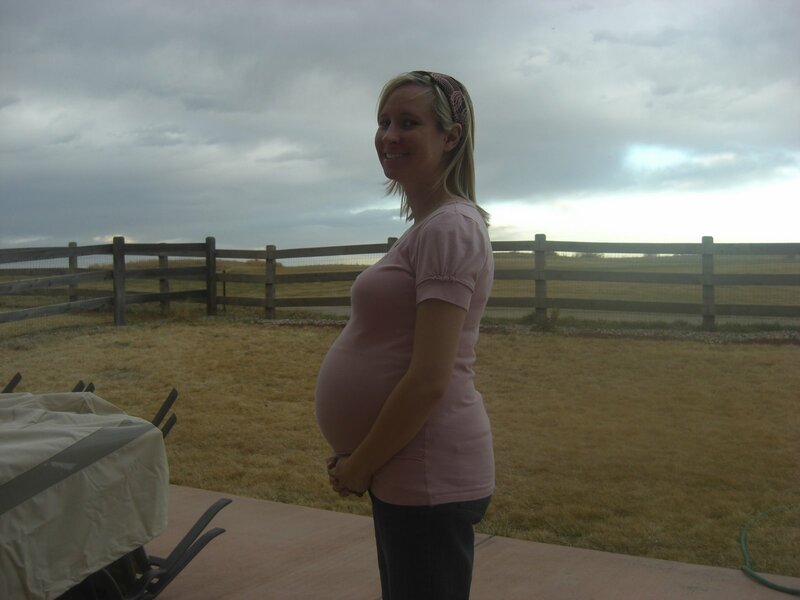 BUT I am thrilled that you are 30wks how fun, we just surpassed the 32 wks and are on the home stretch….it will be fun to have babies the same age again even if we are so far away! You look Fabulous, keep us posted. It’s so nice getting closer to the end! You look absolutely fabulous! And good luck to Rusty! Yeah for the big 30! I hear ya on that. I’m 35 weeks now, and am just counting down the days! You look great by the way! You are way too cute pregnant and way too small to ever carry or deliver a nine pounder! I must say you have great maternity style Tara. Nice job!